For some years now Frenchman Jason Lamy-Chappuis has been claiming in a loud and clear voice that he can take a gold medal in the Nordic combined at the Vancouver Winter Games. At just 23-years-old the boss of the French team knows he is still a yard short of the world number one spot, but looking at his early 2009-2010 season form he knows that on a single day event he can actually pull it off. And given that the man from the French part Jura mountains came 4th in the sprint at Turin back in 2006, he should now have the means to get on one of the podium steps, if not the top one, out in Canada. Being one of the best 'jumpers' on the circuit, all he needs to do is limit the damage in the actual skiing. 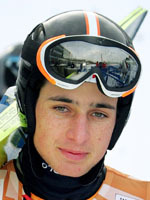 Despite a training injury to his back in the summer of 2008 Lamy-Chappuis had a reasonable 2008-09 season with two bronze medals at the Liberec world championships, six World Cup podiums and, as with 2006 and 2008, fifth place overall. At the end of the pre-Olympic season the Frenchman had racked up five world Cup wins, the last of them in January 2008, giving him a total of 20 top three finishes. He was born in Montana in the United States to an American mother and a French father, who were both ski-instructors at Copper Mountain holiday resort. But the family moved to the Jura, where his father Daniel works in computing and his mother teaches English. There it was that the young Jason first began cross-country skiing at the age of five and indeed ski-jumping on the occasional world cup circuit venue of Rousses, which was just 5km from the family home. As a kid he was a fan of 1992 Albertville Olympic champion Fabrice Guy and his runner-up, another Frenchman Sylvain Guillaume. Guy would later pass on precious council to the rising young talent. Refusing to give up on either discipline the logical choice of competition sport was the Nordic Combined, where French team director Nicolas Michaud, took the ten year old under his wing. He made steady progress and made his World Cup debut at the Mecca of Nordic skiing, Holmenkollen in March 2004, coming in 27th. He was to swiftly establish himself as a regular feature in the race for podium places on the circuit. He blew his 2007 World Championships, but was to win the sprint crystal globe and come 2nd in the World Cup overall that season. But for now, the man who wants to become an airline pilot has one major flight in mind, the one at Vancouver that could make his dream come true with an Olympic gold. Then perhaps he'll step aside and allow his brother Ronan, seven years his junior, to step up and fly the family flag in his place.